Our flexible approaches use the latest website technologies. We Stay Ahead of the Learning Curve So You Don’t Have To. ComBridges has been creating websites for more than 20 years. Digital marketing strategist and mentor, Jon Leland, leads every project with more than 40 years of marketing communications expertise. To better serve your needs, our website design options include a spectrum of solutions from fast, collaborative “1-to-1 Get-It-Done” Squarespace websites to more elaborate and complex WordPress sites. We can help you use the most effective website platform for your business. As website design platforms have evolved over the decades, our commitment to help small businesses build the most effective websites possible—with maximum “bang for their bucks”—has led us most recently to WordPress to Squarespace. More complex, custom-designed websites are typically done in WordPress; and we do elegant, simpler websites using Squarespace. Which type of website fits your budget? This three-column chart will give you an overview of generic costs. We will be happy to provide a more accurate cost estimate if you will kindly contact us so that we can discuss your specific needs. We are also pioneering new kinds of “Done-With-You” services, including our 1-to-1 Get-It-Done Squarespace Website offer which provides a three-hour session with digital marketing strategist, Jon Leland, where he works with you directly, in real time in order to at least get your website started (and sometimes finished), provides digital marketing mentoring, and teaches you the basics of the Squarespace platform. 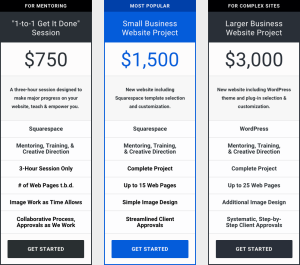 For many people, this is a powerful shortcut to getting their website done quickly and well. Learn more. If you would like to see some samples of our work, please use one of the links on this page to explore our Squarespace Portfolio or our WordPress portfolio. Got questions? Not sure which website platform is right for you? Click here for your free consultation. Peter GoodmanPresident, Six Palms Media Inc.